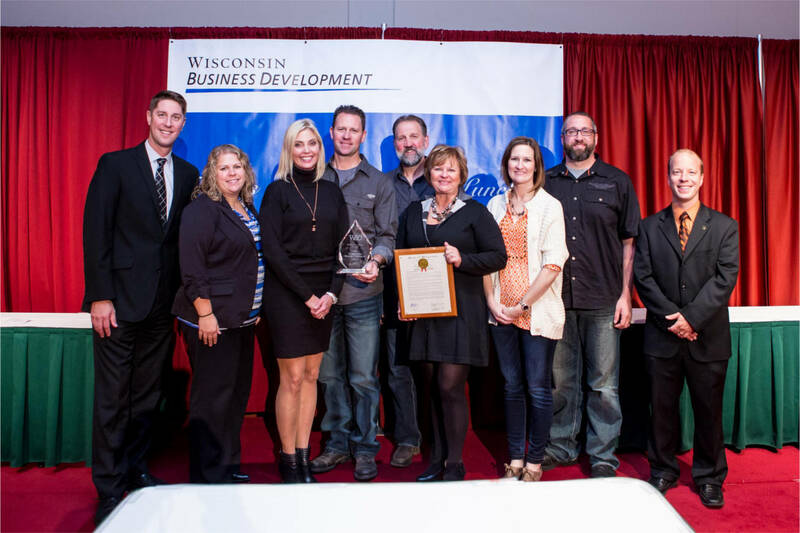 Vandervest Harley-Davidson® receives the 2015 Wisconsin Business Development (WBD) Community Impact Award. WBD has been partnering with WI financial institutions since 1981 to provide business financing solutions that allow small businesses to grow, create jobs, and strengthen our economy. the Community Impact Award is given to a business that highlights the WBD mission of job creation and community involvement. Vandervest Harley-Davidson®, which first opened in 1998, is a nine time Harley-Davidson® Circle of Excellence winner and is recognized as on of the top Harley® dealerships in the region. In 2011, with the help of WBD they were able to secure financing to purchase a building, add an addition, and make renovations. They also added "Olde 41" banquet facility and outdoor patio along Duck Creek which have hosted a wide variety of public events. The Vandervest Family organizes events and charity rides to raise funds for various causes in the area including Veterans, the homeless, M.D.A., local food pantries, and their signature event, the Jerry Parins Cruise for Cancer, draws riders from across the state and beyond including members of the Green Bay Packer Organization, raising over $1,000,000 since its inception. Members of the WI Legislature, on the motion of Dave Hansen and Representative John Nygren congratulate Vandervest Harley-Davidson® for receiving this prestigious award. L to R: Dave Englebert and Bridget LeCaptain from BayLake Bank, Amy Vandervest, Erik Vandervest, Rick Vandervest, Lynn Vandervest, Dixie Kinnard, Eric Kinnard-the Vandervest Family and Jason Monnett of WBD. Vandervest Harley-Davidson® was awarded with the Harley-Davidson® Motor Company Silver Bar & Shield Circle of Achievement award for the 2014 calendar year. Vandervest Harley-Davidson® earned the Silver Circle of Achievement award for the Great Lakes market based on their motorcycle and related product sales performance, an evaluation of customer service and satisfaction, and various operational measures. "One of the primary reasons the Harley-Davidson® brand has such tremendous customer loyalty is because of the efforts of dealers such as the Vandervest family," said Mike Kennedy, Vice President and Managing Director of the Harley-Davidson® North America Region. "We're really proud to have the Vandervests as part of the Harley-Davidson® family." 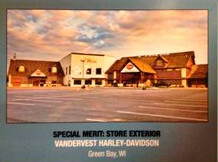 Vandervest Harley-Davidson®, 1966 Velp Avenue, has been in business in Green Bay since 2012. Including their previous dealership which was located in Peshtigo, WI,the Vandervest family has been awarded the Bar & Shield award nine times. The new Vandervest Harley-Davidson® store in Green Bay is a beauty-a cabin-themed dealership featuring a back deck that overlooks Duck Creek, and a large stone patio for customers to sit back and relax. Owners added two new buldings to the tranquil setting, keeping with the log-and-tin rustic look of its surroundings. When night falls, the facility is even more breathtaking with the backlit windows showcasing three Harley-Davidson® Anniversary bikes, along with one of Evil Knievel's rides hanging from the dealership ceiling. The best part: The Vandervest family - and friends - performed most of the interior finish work and outdoor landscaping themselves. It's truly a labor of love. Our Mission Statement: Teamwork, Commitment, Quality, Excellence....in everything we do and for everyone we serve. Pictured left to right: Erik and Amy Vandervest, Dixie & Eric Kinnard, and Lynn and Rick Vandervest. Click on Impact pic and go to pages 24 & 25. Vandervest Harley-Davidson® opened for business on May 1, 1998 in Peshtigo, WI. Vandervest Harley-Davidson® has since closed the Peshtigo location and is now on Highway 41/Velp Avenue in Green Bay, WI. Vandervest Harley-Davidson® is owned and operated by Rick and Lynn Vandervest, along with their son Erik, general manager and daughter, Dixie, who works in the MotorClothes® Merchandise & Harley-Davidson® Accessories Dept. and accounting/marketing. 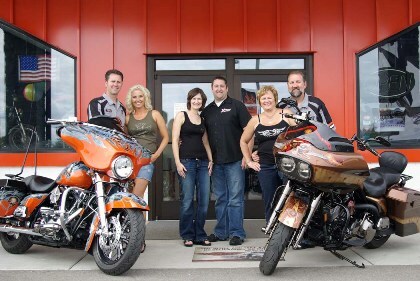 Dixie's husband, Eric Kinnard is sales/finance manager at Vandervest Harley-Davidson® in Green Bay, WI. 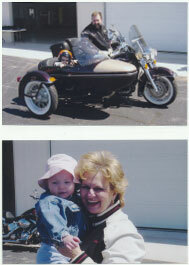 The Vandervest family all drive Harley® bikes. They know the importance of good service and customer relationships. They have a passion for Harley-Davidson®. Their technicians are Harley® certified and take pride in their work on used motorcycles. The service department is always kept neat and clean. The Vandervests are known for providing award winning service. Vandervest Harley-Davidson® in Green Bay is an impressive new three-building structure that has been under construction since fall of 2011. The dealership opened on July 23, 2012. The Vandervest family did most of the interior finish work themselves adding personal touches that will be familiar to patrons of their Peshtigo location. Rick Vandervest created the look of an old western town inside the dealership using reclaimed barn board and tin. You will also see a drag-racing strip and an actual drag Harley® racing up one of the walls and Evel Knievel making a jump over the balcony of the showroom. The new part of the Vandervest building consists of a service center with underground storage and a two story showroom. In the original structure, there is retail space on the lower level and a banquet facility on the second floor. The Olde 41 Premier Banquet and Event Facility, as it will be called, boasts huge wood cathedral ceilings with rustic wood and slate floors along with a generous deck with stairs leading down to a patio on the ground level overlooking beautiful Duck Creek. We strive to ensure customer satisfaction and convenience and serve customers from all over Wisconsin including Milwaukee, De Pere, Shawano, Manitowoc, Appleton, Menominee, Marinette, and Howard. We offer sales for new and used Harley® trikes and Harley® Dyna®, Softail®, Harley® Sportster®, Touring motorcycles, and V-Rod®. We also have parts, accessories, MotorClothes® and collectibles. We offer Rentals and Riding Academy. Vandervest Harley-Davidson® earned the awards based upon an evaluation of customer service and satisfaction, motorcycle and related product sales, trained and skilled staff, facilities and other operational measures. "One of the main reasons Harley-Davidson® has such tremendous customer loyalty is because of the efforts of dealers such as Rick Vandervest," said Bill Dannehl, Harley-Davidson®'s Vice President of North American Sales and Dealer Services. "We're really proud to have Rick Vandervest as part of our Harley-Davidson® family, and we look forward to many great years of doing business together." 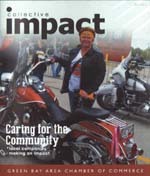 Vandervest Harley-Davidson® was awarded Harley-Davidson® Motor Company's prestigious Gold Bar & Shield Circle of Excellence Award for the 2010 calendar year. 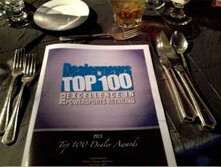 This award is given to the top four Harley-Davidson® dealerships in the North Plains region. Vandervest Harley-Davidson® earned the award based on their motorcycle and related product sales performance, an evaluation of customer service and satisfaction, and various operational measures. "One of the primary reasons the Harley-Davidson® brand has such tremendous customer loyalty is because of the efforts of dealers such as the Vandervest family," said Mike Kennedy, Harley-Davidson®'s Vice President of North American Sales. 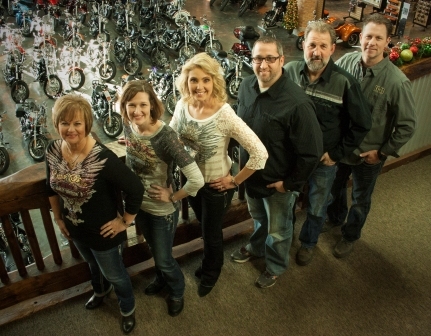 "We're really proud to have the Vandervest family as part of the Harley-Davidson® family. Congratulations to Rick, his family and the staff at Vandervest Harley-Davidson® for receiving these honors. 2000, 2001, 2003, 2005, 2008, 2009, 2010, 2013, 2014! Rick and Erik giving out plaques for our Rod & Bike Show. Vandervest Harley-Davidson® "Glory! Greatness! Legend!"